A rock from outer space, an ultra-thin calibre and a flying tourbillon - meet the new Piaget Altiplano Tourbillon. The pre-SIHH 2019 blitz has started… so hold on tight and get ready for a volley of novelties. This year Piaget goes for a galactic touch and has given its ultra-thin Altiplano a dial made from a sliver of meteorite. Countering our earthly gravitation with a flying tourbillon, this limited edition Altiplano is lit up with diamonds on the bezel. We were fortunate enough to get our hands on this Piaget model before it will be officially unveiled in Geneva next January. As Brice mentioned in his hands-on coverage of the other pre-SIHH 2019 Altiplano – also with a meteorite dial – this new Altiplano does not count as an earth-shattering novelty from Piaget. 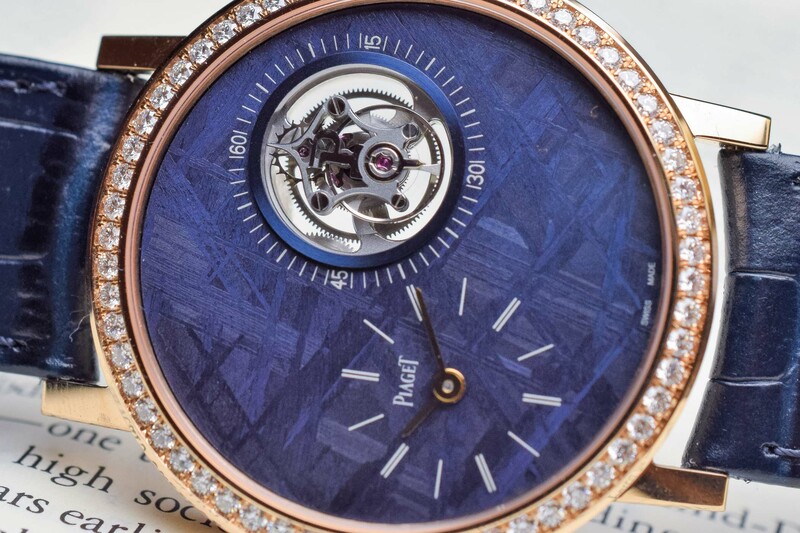 The Altiplano is something of an icon in Piaget’s line-up and celebrated its 60th anniversary in 2016; ultra-thin movements are very much an in-house speciality, and the flying tourbillon has appeared on several Altiplano models already. 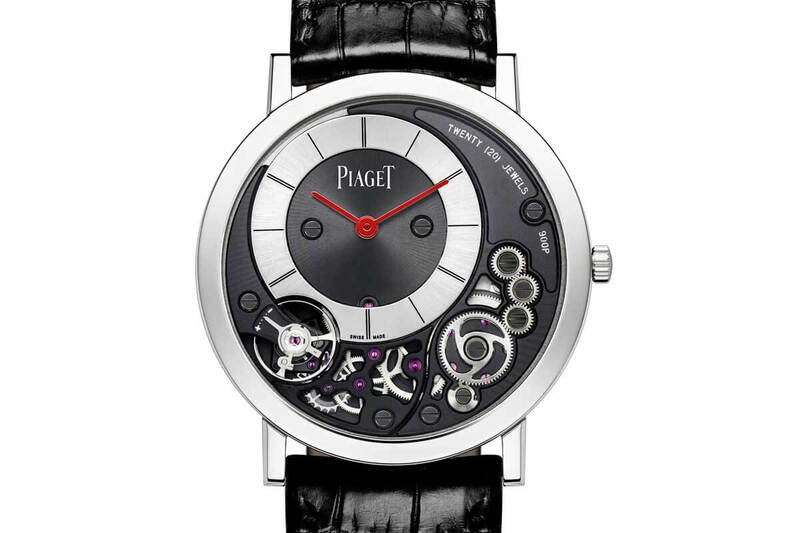 Even the decision to use a meteorite dial fits in perfectly well with Piaget’s longstanding love affair with rocks. 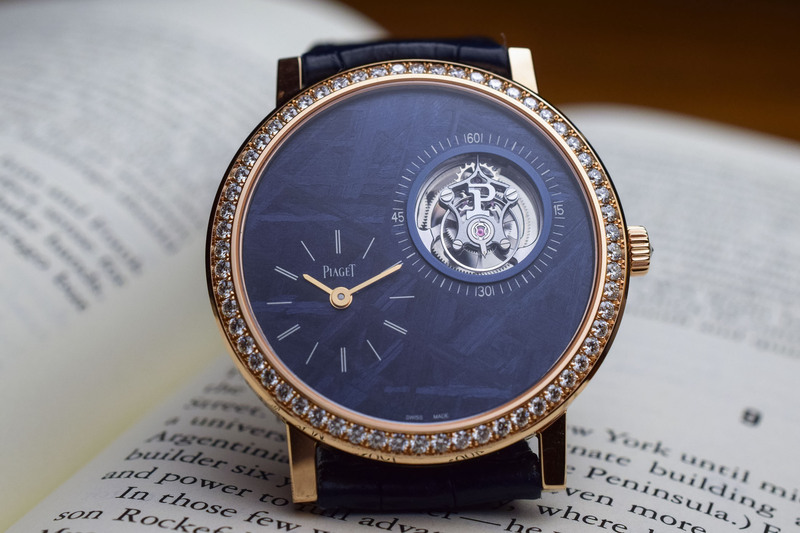 One of the few watch brands with an equally strong focus on fine jewellery, Piaget made a name for itself in the 1960s and 70s with its daring use of exotic, colourful stone dials (onyx, turquoise, tiger’s eye, etc.) 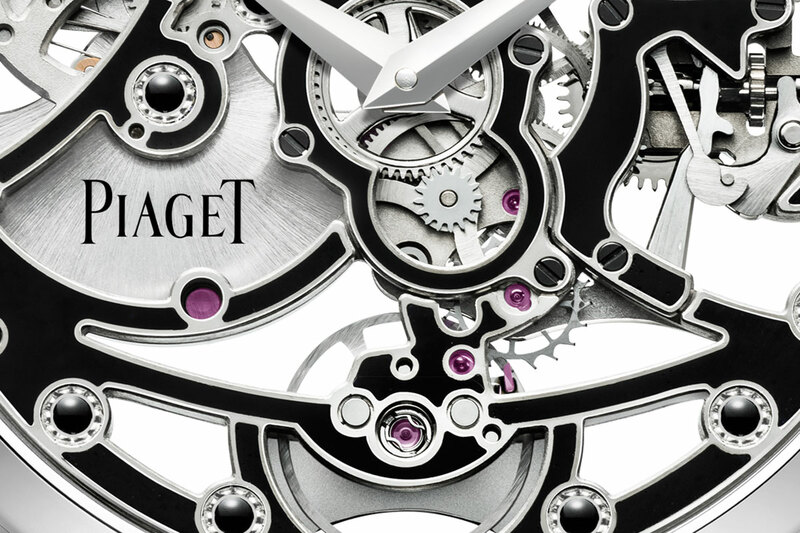 Piaget’s groovy stone dial watches were made possible thanks to the development of wafer-thin movements. The famous ultra-thin mechanical hand-wound 9P calibre, presented in 1957 was a mere 2mm thick, and three years later, the house launched the Calibre 12P, the world’s thinnest automatic movement at just 2.3mm high. 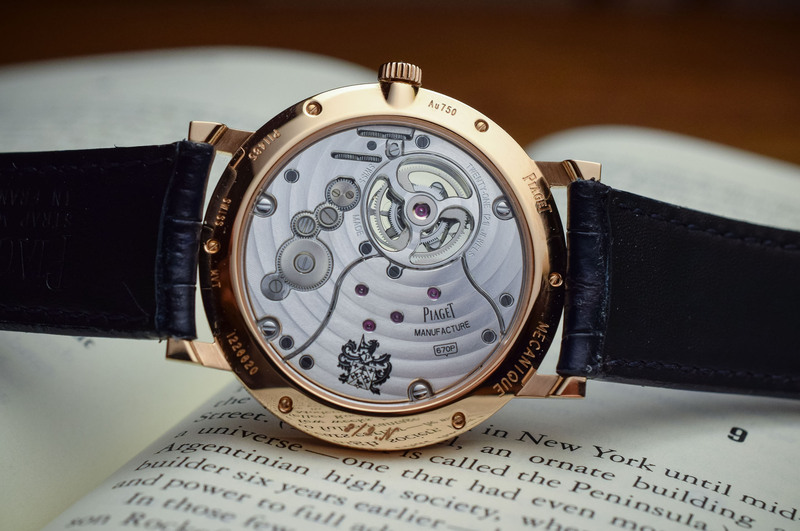 More recently, Piaget’s ongoing battle for ultra-thin movements has resulted in the 1200P of 2010 and the extraordinary 2mm-thick Piaget Altiplano Ultimate Concept presented at the 2018 SIHH. For a current review of the contenders in the battle for ultra-thin, don’t miss Brice’s comparative analysis. Meteorites are basically chunks of debris from asteroids or comets that collide with Earth or the Moon and date from the very beginnings of time when the cataclysmic events that resulted in solar systems detonated in space. The fascinating crisscrossing patterns are formed when the rock ignites in the atmosphere and are known as Widmanstätten patterns, typical of the crystallised nickel-iron structures found within iron meteorites. Having a sliver of outer space meteorite on your wrist definitely adds a galactic dimension to time. In the case of this Altiplano, the meteorite has been dyed blue. Cutting meteorite into wafer-thin slices is not the easiest of tasks and Piaget’s background in gemstone cutting came in handy to whittle it down to size and fit in its ultra-thin Altiplano case. 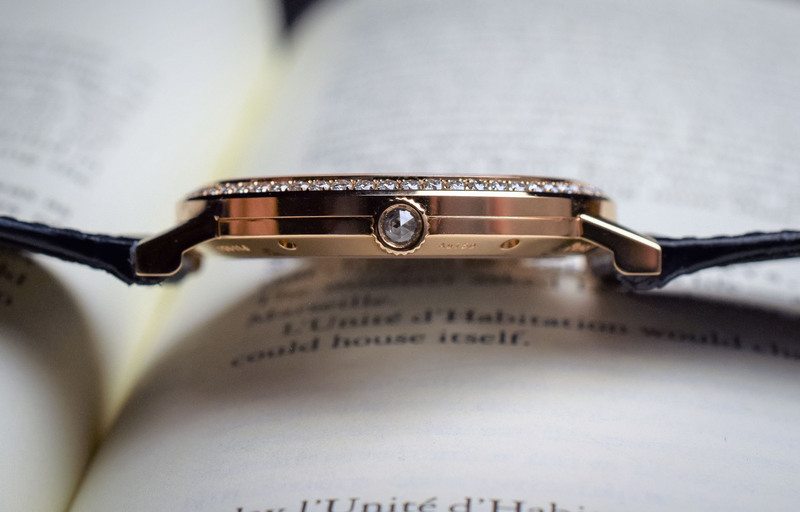 The 41mm case with its height of 7.4mm is a classic Altiplano pink gold case embellished with brilliant-cut diamonds on the bezel and a briolette diamond set in the crown. 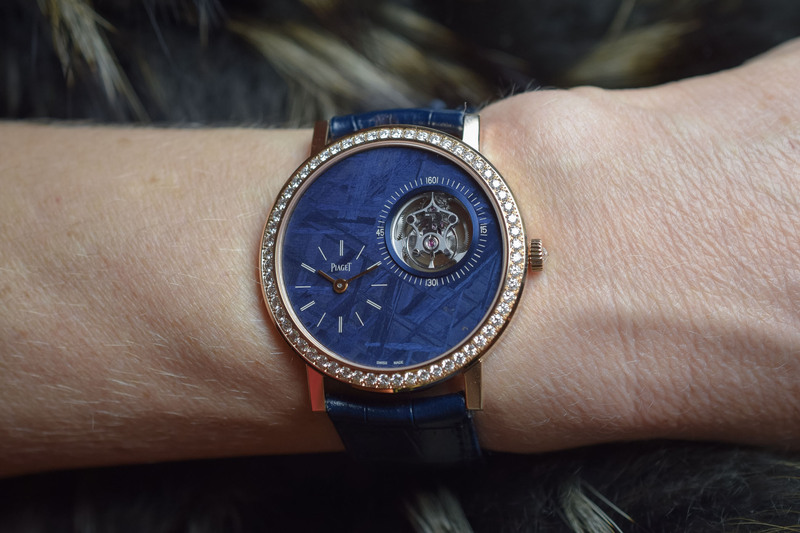 The contrast of the pink gold and diamonds with the blue meteorite dial is dramatic yet elegant. The dial features two off-centred elements, the hours and minutes at 8 o’clock and the aperture for the flying tourbillon at 2 o’clock. This eccentric positioning works extremely well here giving the functions a kind of planetary/orbiting feel, and also recreating the figure 8, a Piaget signature. The hours and minutes are indicated by golden baton hands and thin hour markers, just like those featured on many other Altiplano dials. 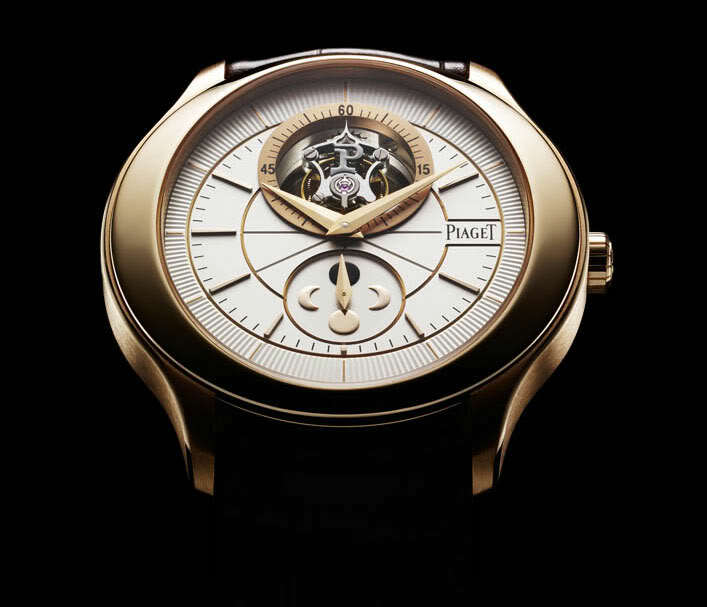 The flying tourbillon, which doubles up as a small seconds register, features a bridge with a ‘P’ for Piaget in its centre. 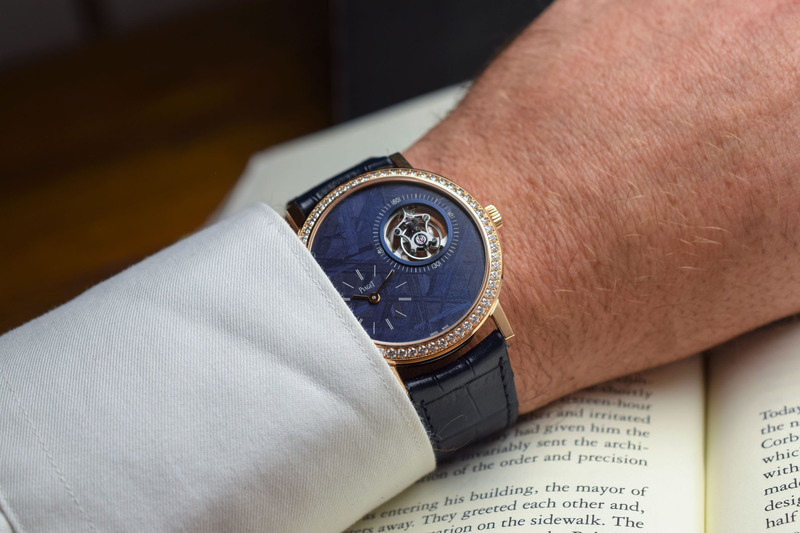 The 2019 Piaget Altiplano Tourbillon is equipped with calibre 670P, an ultra-thin hand-wound tourbillon measuring 30.6mm in diameter and with a height of just 4.6mm. Beating at 21,600vph, the watch has a power reserve of 48 hours. 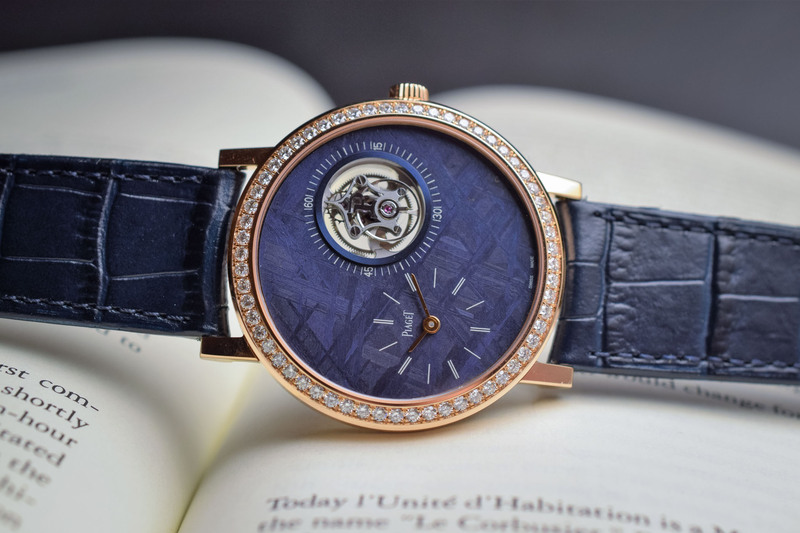 The finishes include circular graining on the plate, hand-bevelled bridges with circular Côtes de Genève, sunburst brushed wheels, black screws and a hand-bevelled flying tourbillon cage. An elegant tourbillon complication set against a rare backdrop with an ultra-lean profile, the Piaget Altiplano Tourbillon has a lot going for it. The unusual patterns etched into the meteorite on its blazing trail to Earth, the eccentric placement of the functions and the diamond-set pink gold case are eye-catching, to say the least. 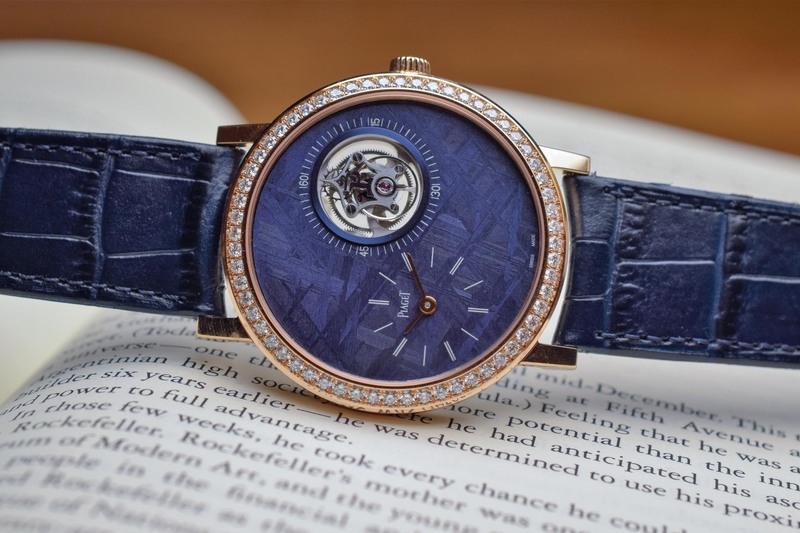 Perhaps the only dissonant note – and it works across the board with all Altiplano Tourbillons – is the somewhat fussy and outdated tourbillon cage with the central ‘P’. The Altiplano Tourbillon comes on a matching blue alligator strap with an 18k gold pin buckle. A limited edition of just 28 watches, the Piaget Altiplano Tourbillon retails for EUR 110,000 (before taxes). 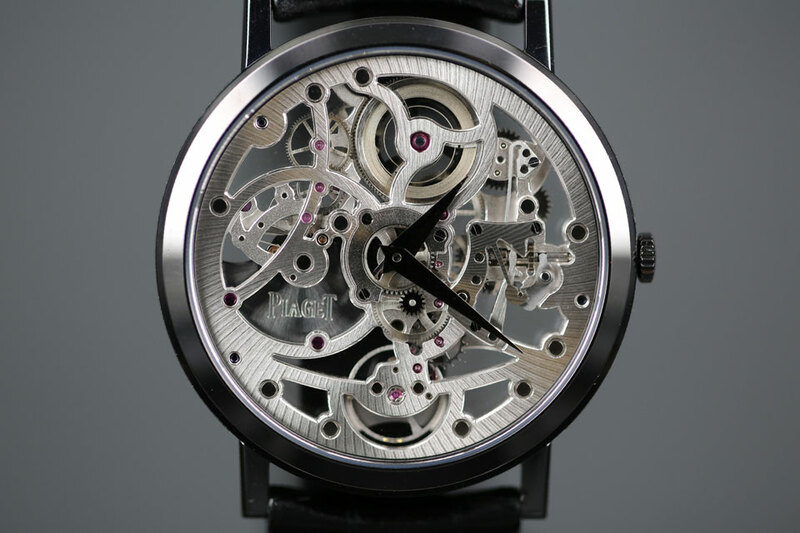 For more information, please consult www.piaget.com. Make the case from white gold or titanium.